Welcome to our FAQ page. Below you will find a variety of common questions we and general information divided into 3 sections. Why should I hire professional movers? Ever moved even a piece of furniture or rent a U-haul yourself? Not so easy right? Truly professional movers, like other professional home services, are worth the money as they possess specific skills, strength and stamina and are properly equipped to transport your household goods in a safe, efficient and reliable manner. A lot of outfits claim professionalism, but the proof is in the pudding. Now obviously you can't taste said pudding without first making a commitment so please do your homework (see next FAQ). Important questions to ask all potential movers. Don't be fooled by a fancy website or overzealous sales personnel, do your homework, obtain ~3 quotes and make a decision with confidence. Some basic introductory questions are below. Remember in most cases, you get what you pay for. How do you differentiate yourself from other movers? Read about our esteemed differentiator below under valuation. How do you charge? Are there any other undisclosed costs or fees? Nobody likes hidden fees. Can you provide proof of insurance? A valid Certificate of Insurance (COI) should be readily available. Can you provide proof of operating authority? An operating certificate is required for PA and interstate movers. Do you offer valuation (see FAQ below)? If they don't or only offer released valuation avoid like the plague! What are savvy consumers looking for when they visit review sites? There are a lot of options when it comes to online reviews today. Facebook, Google, Angie's List and Yelp being the most popular. The thing to look for is not necessarily the sheer amount of reviews, but the quality of the reviews themselves. Are they genuine clients with actual experiences or do they lack credibility? Another thing you'll want to hone in on is the overall grade. Usually the law of averages is a good indicator, however a company with fewer reviews can be adversely effected by a single negative review. Lastly, but certainly a must do - check out the negative reviews. Again is it credible or is someone attempting to wreak havoc on a company's reputation? Credible - GREAT as accidents do happen. This provides the most informative test of a company's character - the validity of their response or lack thereof? How do you calculate the cost of my move? The 3 main factors that go into the cost of a move are the amount of items to be moved, the access at each location and the distance between locations. All estimates provided are based on these factors so it's crucial that you keep us informed on ANY changes leading up to moving day. Slight changes can usually be easily accommodated, however large changes can result in a change in resources. The cost will also vary depending on the details. Additional services such as packing, junk removal and storage will also effect the price. ​Should I tip my movers? The tipping of movers is entirely voluntary. However moving is extremely hard work and any gratuity offered for a job well done is greatly appreciated. The average tip is $5 per mover per hour worked. You can obviously adjust this based on your overall level of satisfaction. Please know you're welcome to tip each mover individually or provide a lump sum to the crew leader who will divide it evenly amongst the crew. If you plan to tip please have cash on hand! ​This is crucial! It's only the level of liability movers are responsible for in the event of damage to or loss of your belongings. All movers are legally obligated to offer 'released valuation' at no additional cost. 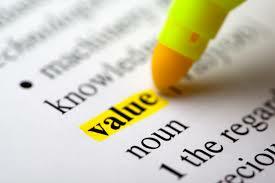 Released valuation covers your belongings at $0.60 per pound. That's right sixty cents per pound which means if damage were to occur to any particular item or the entire load was lost due to a an accident you are entitled to pennies on the dollar in compensation regardless of circumstances. For example: a mover accidentally drops your 100 pound dresser breaking a leg and scuffing the corner yields you $60 in return. Meanwhile a repair is going to cost no less than $100 and replacement will be several hundred or much more? Now imagine your 10 pound stereo components valued at $1,000 gets wet due to a leaking truck roof that nobody knew about previously. You're entitled to $6. That's it. What if the truck containing everything you own gets knocked off the road and burst into flames? Say you have 6000 pounds worth of goods on board, well that will yield you a whopping $3,600 to replace everything. Good luck! Please understand in our professional opinion this is an absolute joke and should only be accepted if you have an extremely high risk tolerance or simply don't care. It's not that many successful moves haven't been completed under released value protection, it's that slim chance things go awry and some horrific scenario unfolds leaving you between a rock and a hard place. Under law all movers must offer an alternative to 'released valuation'. That alternative is called 'full valuation' in which movers are responsible for the replacement value of your damaged or lost goods. This is a much more practical alternative, but bears an additional cost depending on the overall value you place on your shipment and desired deductible level. This is where our unique value proposition comes into play. Frankly we don't feel 'released valuation' is fair to consumers. Rather we automatically carry your belongings at a full valuation of $10,000 with a $250 deductible and don't charge any extra for doing so. That's our commitment to quality service and a significant differentiating factor amongst our competitors. Please note full valuation protection in excess of $10,000 with various deductible levels is available at an additional cost. It is also important to mention that replacement value is NOT what you paid for an item, but what it is worth in its current state on the day of damage or loss. For example if you paid $5,000 for a high end flat screen TV 3 years ago, it's not worth $5,000 today. Items of extraordinary value - those worth more than $100 per pound (jewelry, china, furs, electronics, antiques, etc.) that you intend to be loaded onto the moving truck must be documented prior to the day of the move or they cannot be covered under full valuation. It's important to note that both Full and Released value are not insurance policies governed by state insurance laws; instead, they are Federal contractual tariff levels of liability authorized under Released Rates Orders of the Surface Transportation Board of the U.S. Department of Transportation (DOT). Moving is a big deal. So big you should be thinking about it months in advance when possible. And obviously the more belongings you posses or larger your family the more complex of move it will be. 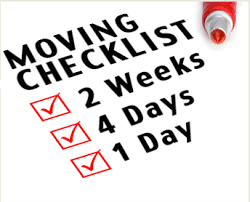 It's a good idea to contact movers 6-8 weeks in advance of your move to allow the best possible scheduling options. This is crucial if you plan to move during the busy season (April through September with June and July being the absolute busiest months for movers). Scheduling well in advance is especially crucial if you plan to move on a Saturday or any other day falling at the end or very beginning of a month. The reason for the uptick in demand at the end of month is due to all the leases that are turning over. Besides it pays to start planning well in advance of your desired move date. Not only does it provide peace of mind which is often undervalued, but a quality moving company can be a great resource for the many questions you'll have along the way. How do I pack up? If you plan to do all or even some of the packing yourself, you're going to want to start well in advance (4-6 weeks) of your move date if possible. We know life gets busy, especially in the summer months, and it will take much longer than you actually think. The first step is sourcing materials (see next FAQ). Once the proper materials have been acquired, you're ready to go. Our single best packing tip aside from playing music: Assuming you have the room, construct 2-4 of each small, medium, and large boxes. Position them in the room or area you wish to pack and go to town. This way likely anything you grab will fit somewhere, saving you precious time you'll never get back! See our Ultimate Guide for additional packing tips! In order to maximize your efforts here, you'll also want to utilize this time to purge unwanted belongings (see "What to do with unwanted items?" FAQ below). When it comes to packing, too often people set out with good intentions, but end of running short of time and moving everything, included unwanted items, to their new location. Not only are you now paying to move unwanted goods, but you also have to deal with them at your new location. The more you take care of ahead of time, the better you'll feel and quicker you'll return to life as normal! We know what you're thinking. This is an easy area to save money on the moving process by sourcing free boxes from local grocery and liquor stores. While this is true, we strongly discourage it and here's why. First off is the quality of boxes you bring home, simply put they are not designed for household goods as most are inferior in construction. Next problem is the inconsistent sizes. Not only will they be harder to pack, but also more difficult to move. Lastly, you never know what was in them prior or what you could be inviting (think pests) into your home or business. Aside from boxes, you'll also need newsprint/packing paper and/or bubble, plenty of tape, a tape gun, a box cutter and markers. If you wish to source quality moving materials yourself, the best value can be found at the big box home stores such as Lowe's or Home Depot. However, you will find the largest variety of boxes and packing materials at your local U-haul or storage facility. If you'd like professional quality moving materials delivered to your door shop our Box Shop where we have everything you need to get your pack done right. Your best bet is to go with one of our customized apartment, household, or business bundles that include a variety of packing materials. Our bundles are more generous than average as we don't want you running out of material before the job is done. Don't worry we will buy back any unused material on the day of your move! The best part is these packages are delivered free of charge should you book your move with us! Lastly please don't waste your money on wardrobe or TV boxes when you can take advantage of our rental program. These boxes can be delivered with your purchased bundle ahead of time or provided on the day of your move. For Philadelphia area local moves and those with destinations in greater NYC, you may also be interested in utilizing a reusable bin service for your packing needs. We cannot express how awesome these things are to both pack and move. Not only are they cost effective, but eco-friendly. Check out Bin-it for details and tell them we sent you! Should I remove my items from drawers? YES. We understand it creates a bit more work when packing, however both your personal effects and your furniture will thank you. Leaving items in drawers makes furniture heavier and can damage the structural integrity of the furniture. Plus your personal effects can shift as your furniture is handled and possibly turned upside down or on end for safe transport. What to do with unwanted items? Although parting ways with things can be difficult for some, a great rule of thumb is if you haven't used it in the last year, you don't need it. This rule obviously doesn't apply to everything, but certainly keep it in mind. Think of it as simply letting go or recycling by donating gently used items to a local goodwill agency, school, library, church, etc. Other methods to rid yourself of unwanted items are to: sell or give away on Craigslist, conduct a moving/yard sale, and/or utilize the LetGo app. You can schedule picks up with some agencies such as the Salvation Army. However should you run short of time or not want to deal with this at all, we're here to help. Our team is equipped to remove unwanted items before, during or after you move. We can transport to a local facility of your choosing, deliver within our charitable network or dispose of if necessary. Our removal service makes freeing yourself of unwanted items quick and easy. Please note these services must be scheduled in advance and do come at an additional charge. What can I move myself to reduce risk and/or save money? There are absolutely things you can do to reduce the overall level of risk involved in your move. The single biggest risk mitigator is handing all the small, high value items yourself (think passports, cash, jewelry, tablets, laptops, gaming systems, etc.) in a personally carried bag or box. Please don't think these items cannot be trusted to mover's, it just a simple way to avoid potential problems. Now let's say you have time and access to vehicle before or during the move and want to cut into the overall cost of your move. The following is a list of things you can move yourself in order to maximize your efforts - think valuables such as TV's, computers and stereo systems; breakables such as large photos and mirrors; odd-shaped items such as lamps and artwork; family heirlooms such as photo albums, grandmother's china and antiques; plants, yard art, yard tools and equipment (especially those with fuel inside); large toys, bicycles, perishable foods, liquids of any kind and items we are not permitted to carry (see next FAQ). Lastly, but certainly not least, during your walkthrough prior to the start of your move, do point out any furniture or large items of extreme importance to you or your family/roommates/colleagues. This way the mover's can take extra precautions to ensure the safe movement of those particular items. Are there items that cannot be transported in the moving truck? We are not permitted to move any hazardous or combustible items such as fuel, propane tanks, firearms, ammunition, paint, and aerosols. Furthermore we are not permitted to transport clients or their pets. We will move houseplants, however cannot accept any liability as they may be exposed to extreme temperatures which may effect their health. Finally we reserve to right to refuse any liquids as the can leak and cause harm to other items. How should my home/business be organized? When moving day arrives, or preferably before hand, please ensure your home is organized to the point where we can easily access all rooms upon arrival. The first thing we will do is have you give us a quick tour of your home or business, pointing out what is to moved and what's not, special care items, etc. It's also a good idea to provide key visuals in order to reinforce instruction. Closing doors in rooms where there's nothing to be moved or we are not welcome, using signs such as "Do not enter", "Do not move", "Donation" etc. will help limit questions throughout the day. If you have a designated restroom you'd like us to use, point that out as well. In order for us to work efficiently please ensure all personal effects are packed or any last minute items are picked up and out of the way (think bed linens, hygiene products, charging devices, remotes, etc. ), all doors, walkways and stairwells are clear and easily accessible, exterior doors are unlocked, closets door are open (if there are things to be moved out), all cords are unplugged, children are under close supervision and pets are confined so they do not slip out an open door, etc. The more things you can take care of ahead of time, leaving only boxes and furniture for us, the quicker the we can work and the faster your job gets done! Who needs to be present? It's most ideal to have a prominent family or business member present for the entire duration of the move. However, if circumstances do not allow, then we can make due and still carry out your move. Hopefully someone is available in the beginning of the job just to provide the tour and any last minute instructions, but we can also coordinate with those who cannot be present at all or only available by phone. The less availability one has on move day, the more crucial it is that they keep in touch prior to the move to ensure proper plans are in order. Visual instructions are most helpful in these situations (see "How will the movers know..." FAQ). What do I do with my sentimental items and prized possessions? These may be things you wish to move yourself simply to reduce the overall risk involved. Should you not trust yourself or just prefer to leave it to the professionals, simply let us know ahead of time so we can take special precaution. You'll also want to be sure to reiterate your concern over these pieces during the walk with our crew at the onset of your move. How will the movers know where things go in my new home/business? This is where a concise labeling system is key. It's great that you spent the time labeling and organizing your boxes in preparation of your upcoming move. However it doesn't do much good if those boxes don't end up in the right place at your new location. What if you have multiple stops? Now labeling is even more crucial. The absolute easiest and most foolproof way to label your boxes is to create a level/room/item system using a combination of letters and numbers. Level and Room being mostly for the movers, while Item is mainly for you to reference when unpacking. For example BB1 = B being basement level, B being room or area B, 1 being whatever contents you listed on your personal inventory on line 1. Another example 2C8 = 2 being second floor, C being room C, 8 being whatever contents you listed on your personal inventory on line 8. It doesn't matter what letter or number represents what room, what matters is that each box has a combination, each level and room in the new home or business is labeled with the corresponding letter or number and the key is made known to the movers. Think about how much less you have to write using this method versus spelling everything out. Do label at least two sides and the top of the box for ease of sight with boxes being moved. Furniture, although sometimes self explanatory, can pose a challenge because labeling ahead of time is usually ineffective as most pieces will be covered with furniture pads. If no one is available to direct the us to the receiving location on the day of the move, diagrams should be provided given the general placement of furniture. Can I ride with the movers? Unfortunately we are not permitted nor insured to carry passengers in our vehicles besides we may be sweaty. Grab yourself an Uber, Lyft, taxi or public transportation. Will my move take place in inclement weather? 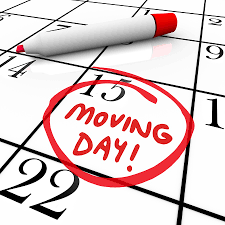 We understand move dates are relatively firm and will work through most inclement weather. However, if weather threatens our safety in anyway, we reserve the right to postpone your move and reschedule on our next available day. Please understand this could be several days to a week later in the event of a busy time. We will do our best to avoid this, but understand if you must cancel in favor of available carrier. In fact we'll even help you find one! How can I be an awesome client? Being an awesome client is really not that hard. Be transparent in the planning process. Be prepared when move day comes - clean, completely packed, organized and ready to go. Be friendly and courteous upon arrival and throughout the day. Offer something do drink such as water, Gatorade or even coffee. If you're feeling exceptionally giving you can even offer something to eat such as fruit, sandwiches, or snacks. Don't be afraid to talk to us throughout the day. Half the fun for us is meeting someone new. Be understanding in the event things are taking longer than expected or an accident occurs. Finally a little gratuity goes along way should you feel we deserve it - and hopefully you will!